Timothy Caulfield is a Canada Research Chair in health law and policy at the University of Alberta. In 2010, he won the Till and McCulloch Award, which recognizes significant contributions to global stem cell research. Earlier this year, I was invited to speak at an international biomedical conference held in a Latin American country better known for its vacation locales than for the quality of its health care system or its scientific research. My talk addressed the marketing of unproven stem cell therapies by clinics around the world. This growing industry, often called stem cell tourism, is fuelled by Internet advertising and social media–driven word of mouth. It appeals to desperate patients who travel to providers in China, India, South and Central America, Russia, and the Caribbean to receive treatments with no chance of success. International scientific organizations, patient advocacy groups, and, in a few notable cases, national governments have roundly condemned these therapies. Last year, for instance, the Costa Rican ministry of health closed one of the world’s best-known clinics. But despite such action, the industry continues to flourish, generating false hope, robbing families of their resources, and potentially compromising legitimate stem cell science. An organization in China claims to have treated more than 8,000 patients with such incurable conditions as autism, amyotrophic lateral sclerosis (Lou Gehrig’s disease), spinal cord injury, and cerebral palsy. The cost of such unproven procedures is substantial, averaging around $30,000 per session. At the conference, I spoke about this problem with passion and clarity—or at least I thought so. The audience, which included clinicians and policy-makers, was not impressed. Afterwards, my host, a respected physician, took me for dinner. During the ride to the restaurant, she explained why my talk had met with such a chilly reaction. She (and, I suspect, many of the other participants) provides stem cell therapies for a variety of serious ailments. She swears they work. As we wove through the city’s chaotic nighttime traffic, she recounted numerous successes, including patients who had regained movement in paralyzed limbs. I didn’t doubt her sincerity; she gave the impression of a caring clinician, not a huckster peddling snake oil. While stem cell tourism, which is likely generating hundreds of millions of dollars, is a worrisome development, it’s part of a much broader trend: capitalizing on newsworthy scientific advances as marketing opportunities. Call it “scienceploitation”—the exploitation of both good science and vulnerable patients. Threads of the phenomenon can be found in the ongoing debates about the efficacy of Italian doctor Paolo Zamboni’s liberation treatment for multiple sclerosis and in questions about the value of alternative medicine like homeopathy. Some scientific hoaxes have led to a dangerous clouding of the facts, as in the fraudulent British research that engendered the myth that vaccines cause autism. These are tough issues. But true scienceploitation constitutes a different and insidious concern. While the ideas may be real, the therapies are unfounded. Just as science fiction bends and stretches the truth in the service of entertainment, science marketing does so with the goal of profit. This has been going on for centuries. Scientific breakthroughs stir the public imagination, become part of popular culture, and then get packaged and sold by opportunists. Research on magnetism resulted in the sale of products promising magical restorative properties, curing everything from gout to constipation to paralysis. According to one advertisement from the late nineteenth century, “There need not be a sick person in America… if our Magneto-Conservative Underwear would become a part of the wardrobe of every lady and gentleman, as also of infants and children.” More dangerous was the excitement over atomic physics in the early 1900s. The work of scientists such as Marie Curie in the field of radiology garnered considerable public interest, which led to an array of radioactive products, including skin creams, toothpaste, bath salts, and pills. A market even arose for radium water, which was said to “revitalize” and “energize.” Not surprisingly, these inventions resulted in dire outcomes: “The Radium Water Worked Fine Until His Jaw Came Off,” read one Wall Street Journal headline. Today the best examples of science spin can be found in more frivolous corners of health care: anti-aging products and wrinkle creams. These lotions and tonics borrow language and imagery from groundbreaking areas of science. Skin creams are “nanotech encapsulated” and “genetically guided.” There are even innumerable stem cell–based elixirs. Of course, this is nothing but scientific babble. When it comes to anti-aging and wrinkle prevention, there is little we can do, other than stay out of the sun and quit smoking. If there were a pill or product that actually reversed the aging process, we’d know. But, strangely, whether or not a treatment works doesn’t seem to matter to consumers. A joint study published in European Advances in Consumer Research found that perceived effectiveness had little impact on women’s use of skin care products. The failure of a skin cream actually enhances one’s motivation to use it; one doesn’t interpret a lack of results as proof of a sham product, but rather as a call to try harder. Still, the reason for the science-based marketing strategy is obvious. The language creates a veneer of legitimacy, and allows manufacturers to leverage the media excitement associated with promising research. And there is evidence that this tactic works. A 2008 Yale University study found that people were more likely to believe a bad or illogical explanation for human behaviour if it included a reference to scientific information. (The study used fake brain scan data to explain psychological phenomena in areas such as attention and perception.) This worked even if the purported data was completely irrelevant to the claim. The mere presence of scientific-sounding language caused participants to believe the nonsensical account of a phenomenon. We want to be wrinkle-free, and we know it’s a lost cause, but the term “stem cells” injects hope. Stem cells, after all, represent cutting-edge science. Who knows—perhaps this will be the cure that works. Research on stem cells, which have the potential to develop into many cell types in the body, is an extraordinarily promising field. One day, likely decades from now, it may result in therapies for conditions such as heart disease and spinal injuries. But at the moment, with a few notable exceptions, none are ready for clinical use. Blood stem cell transplants have long been used to treat a few diseases that affect the blood and the immune system, including some types of leukemia. And stem cells are used in skin grafts and corneal transplants. But that’s it. As yet, no other stem cell therapies have been scientifically verified. Despite claims to the contrary by clinics around the world, no cures exist for autism, ALS, MS, spinal injuries, or Alzheimer’s. A few early-stage clinical trials are under way; the best-known and most scrutinized is one by the American biopharmaceutical company Geron. Its purpose is to test the possible therapeutic benefits of embryonic stem cells in individuals with recent spinal injuries. This is a Phase I trial, meaning that the primary objective is to test safety, not effectiveness. It has taken years for Geron to reach this stage, and to date the company has only recruited two test subjects. It is far from certain that the trial will succeed, and even if it did the treatment wouldn’t be available to the public for years. Geron would still need to move to Phase II and III trials and then, if all went well, seek regulatory approval. A similar process would be involved in the development of any stem cell therapy. Each disease will likely require a unique cell type and a unique cell delivery system. You can’t just inject stem cells into the body and hope they work, which seems to be the basic therapeutic approach of most stem cell tourism clinics. Several patients have reportedly developed tumours from unproven stem cell therapies. In one case, a boy with a neurodegenerative disorder received injections of fetal stem cells at a clinic in Russia. He later developed life-threatening brain tumours. Deaths have also been attributed to these therapies. At Europe’s largest stem cell treatment centre, the XCell-Center, in Düsseldorf, Germany, an eighteen-month-old died in 2010 after having stem cells injected directly into his brain. The government shut it down in May. As noted earlier, these bogus treatments are rarely cheap. Not long ago, I followed a website dedicated to raising money to send an infant girl with an incurable neurological disorder to China for stem cell therapy. The site, created by the child’s parents, requested donations and posted a public countdown for the trip. Its home page displayed a box with the number of days, hours, minutes, and seconds left until the family left for China for the treatment. As the page explained, the parents wanted their little girl to be able to “walk, talk, and see.” Such stories are heartbreaking—and infuriating. Much of the money raised from friends, family, and well-intentioned strangers likely ended up in the pockets of providers who either knowingly deceived the public about the value of the treatment—fraud of the cruellest sort—or wilfully ignored what peer-reviewed literature says about the state of the science. Another force that facilitates scienceploitation is the media. The popular press loves stories about miracle cures and last chances, and pseudo-scientific remedies largely attract positive attention. Last year, I co-authored a study, published in the journal Nature Biotechnology, that examined 445 newspaper articles on the stem cell tourism industry. Most were optimistic in tone and portrayed the treatments as effective; they were framed as human interest stories and driven by patient testimonials. Risk and scientific fact recieved little space. Sample headlines included: “Young Holly’s Brave Stem-Cell Quest”; “Hope for Harvey in Fight Against Palsy”; “El Paso Teen Gets Stem Cell Treatment in China in Hopes of Seeing”; and “Trip to Mexico a Last Resort.” If you are a desperate patient looking for hope, these kinds of stories tell you where it may be found. The public hears this message: if it works in animals, it will work in humans, although this is often—usually—untrue. Successful animal studies translate to successful human clinical trials only about 10 percent of the time. And this rate is for the highly referenced and most influential animal studies; if you include all animal studies, the number would likely be much lower. The public expectations that form the basis of the market for pseudo-scientific products arise from hype, which happens even though true medical breakthroughs are fantastically rare. Science is a slow, incremental plod—two steps forward, one and a half steps back. Skepticism is good, and it lies at the heart of the best scientific inquiry, the starting point that produces the most convincing data and the surest path to true, robust health care advances. History tells us that the likelihood of a new, effective, and widely applicable treatment appearing during the early days of a new sphere of research is minuscule, hovering around zero. So healthy skepticism must remain the default. We should not, however, allow this disposition to slide into cynicism about the value of research. History also promises that genuine benefits will emerge, even if they are more modest than first envisioned. While magnetic underwear and radium water proved to be shams, we now have magnetic resonance imaging and effective radiation therapy. The same pattern will unfold with genetics, stem cells, nanotechnology, or any other new and stimulating field of science permeates the zeitgeist. 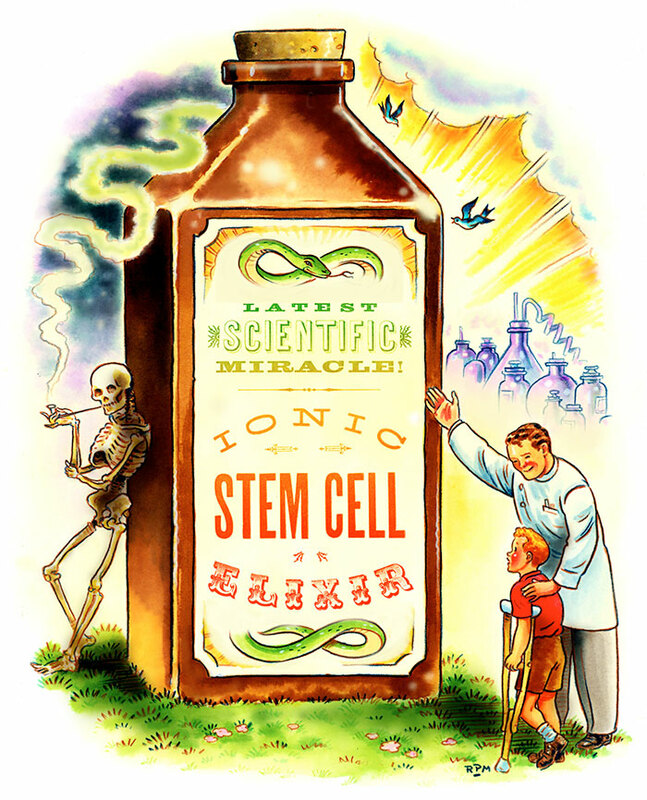 There will be few, if any, miracle cures. But growth in knowledge, whatever the outcome, is certain. Ross MacDonald is a prop designer on Boardwalk Empire and Parks and Recreation. His latest children’s book, Henry’s Hand, comes out this year.